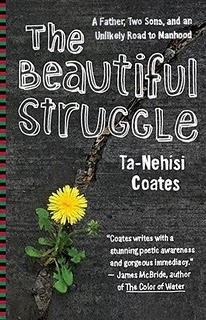 We're moving forward with chapter 2 of The Beautiful Struggle by Ta-Nehisi Coates (TNC). I'm interested in reading what folks have to think. Among other things, Coates mentions the troubles of his city: "When crack it Baltimore, civilization fell" (29). And there was the ever-present violence. The young Coates listens as his dad explains how things were rough when he was younger but not nearly as dangerous as things were for a younger generation of black men. "I didn't fully get it then," writes Coates, "but this was an inglorious turn. The word was filled with great causes--Mandela, Nicaragua, and the battle against Reagan. But we died for sneakers stitched by serfs, coats that gave props to teams we didn't own, hats embroidered with the names of Confederate states. I could feel the falling, all around" (30). We'll have to be sure to point out to the young brothers next year how much research Coates put into writing about his own life. For instance, his observation that "I didn't fully get it then" suggests that he did "get it" later. When? How? There's suggestions here and there throughout the book that he gained knowledge later in life that allowed him to look back on his childhood and put things in context in illuminating ways. I've been fascinated throughout that all the struggles, Coates had a particular edge, namely "conscious" parents. Thus, along with his siblings "we were pushed through science camp, music lessons. Thick books were hurled at us from across the room" (30). Although his older brother, Big Bill, "saw himself strictly in the mode of athletes and rappers, and put no value on his own intellect and bookish wits," their father "struggles to make Bill see what he covered with a street pose, what he didn't even know was there." Anyway, so just a couple of things. What else are people thinking about chapter 2 of the book? What's something we might want to note for the reading group who'll cover the book in the fall? So chapter 2 for me pretty much reinforces, in my opinion, this psychological initiation into manhood. Again Coates is very vivid and poetic. Since his father is not so much a central figure in this chapter, we really start to see how Coates is internalizing and surviving (with his brother, girls, and friends) - learning the "code of conduct" and finding where he does and doesn't fit in. He has a great eye for details to be able to recount things metaphorically and historically, which is why we as readers cannot take for granted the images he situates before us because it's intentional. P. 30 "Kids whose minds should have been on Teddy Ruxpin now held in their hands the power to dissolve your world into white." P. 35 "To be strapped was to GRAB the steering wheel of our careening lives. A gun was a time machine and an anchor - it DICTATED events. To be strapped was to MASTER yourself, to BECOME more than a man whose life and death could be simply SEIZED and HURLED about." All of those action words in there! It's wasn't just about having a gun, but it was the ideology behind it - that possessing a gun was a way for them to elevate themselves and their status. P. 44 "The Conscious among us knew the whole race was going down, that we'd freed ourselves from slavery and Jim Crow, but not the great shackling of minds...We thought all our battles were homegrown and personal, but like an evil breeze we felt invisible hands at work, like someone else was still tugging at levers and pulling strings. The vagueness of the struggle made most of these kids barbarians, but there were a few like myself who were still noncombatants." << This statement is critical because Coates makes us aware that he knew there was a distinction between him and the "others" ff to p. 61 'on The Knowledge' "every black boy must find his own way to this understanding." I did not realize you were doing this study on Coates' book, but what a great idea. Perfect preparation for his upcoming visit on March 23 as part of the CAS Colloquium! @ Symmetry Yes, yep, I'm with you. It's also important to get how Coates, the writer, is looking back on things and so some of what he presents is coming from the luxury of hindsight. It speaks to his talents as a writer, though, that we're *right there* with him in the individual chapters and moments of his childhood. Oh, and thanks for the examples of the actions words in individual sentences. He does make things move, doesn't he? Is all that "action" part of the gendered idea that you were getting at? That is, did you get a sense that a male writer might foreground action more than a female writer? Or, would any answer (and even that question) be too much of a generalization? These are just two instances that highlight being different and not going with the flow of the crowd. Coates' place was that he did not fit in, and that's okay. He knew that his approach was not quite like the other kids, especially when he talks about his take on how to handle turf discrepancies. He plainly said that he'd rather talk and "duck" than duke it out while other young boys around him were literally fighting in the fight/struggle to establish their reputations and affirm and assert their manhood, stregnth, and (street) credibility. For many of the youth around him, this was the only way, but not for Coates. This chapter is classic because Coates is presenting readers an alternative way of establish one's personhood/manhood. Albeit, standing out from the crowd can be a difficult path to take, Coates is showing that it's okay to not be like everyone else and to not walk in sync to the "song" the others all heard. Man! What a powerful revelation to know that we don't have to walk down the commonly trodden path if we don't want to; it's okay to blaze a new trial! How liberating! On another note but kind of the same, the stories surrounding these excerpts do venture into social constructions of manhood through a very particular lens (inner city, male, black, east coast 'hood, etc). As Rambsy would say, "How could we look at this differently?" Maybe, it would benefit first year students to explore how their perceptions of manhood are shaped through their various lenses and how changing even one aspect of their lives could alter what manhood means, thus demonstrating that there is no one set formula to enter manhood. This would challenge them to begin approaching various ideas through different perspectives--something they should do throughout college and life anyway. Whatever walks of life the incoming black male students come from (and anyone for that matter), I believe they could benefit from exploring the theme of not just being different but being okay with being different--whatever that means for each of them. Oh! This was something I noticed in the first chapter but paid more attention to in the second chapter. I dig the way Coates writes his direct quotes of others. It's either displayed in the body of paragraph appearing as regular text or as a stand alone grouping that reads much like an excerpt from a play or script. Both seem to have the effect of putting me right dead smack in the middle of the action, almost like I can see the clip playing in my head. Coates doesn't prep readers with the formality of the traditional quotation marks for his direct quotes, and the way in quotes teleports readers right into the action. Sometimes, it's fun to play with mechanical conventions. I must say his way of doing so with quotes gives a fresh quality to the reading.